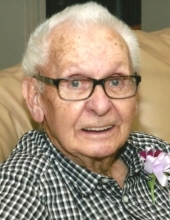 James M. O’Donnell, age 82 of Spring Green, passed away on Sunday, January 20, 2019 at Greenway Manor Nursing Home following an illness. He was born on April 23, 1936 in Lone Rock, WI the son of Fred and Julia (Kessenich) O’Donnell. Jim was married on April 22, 1961 to the former Helen C. Bray. Jim had a kind heart, a great sense of humor, bright outlook on life and loved being around others. His greatest love was for his family. He will be greatly missed by all who knew him. Survivors include his 3 children, Jeff (Tammy) O’Donnell of Spring Green, Michele (Jon) Radlinger of Spring Green, Susan (Shane) Hatfield of Lone Rock, 4 grandsons, Nicholas, Jack, Dustin and Larry, a granddaughter, Lexi, several nieces, nephews, other relatives and friends. He was preceded in death by his parents, Fred and Julia O’Donnell, his wife, Helen O’Donnell, 3 brothers, Fred, William and Philip O’Donnell. A celebration of life will be announced at a later date. A special thank you to the Greenway Manor Staff for their kindness shown to our father. Online condolences available at www.staffordfuneralhomes.com. The Richardson-Stafford Funeral Home is assisting the family with the arrangements. "Email Address" would like to share the life celebration of James M. O'Donnell. Click on the "link" to go to share a favorite memory or leave a condolence message for the family.